India's average internet speed stood at 1.3 mbps in the quarter ended June 30, 2013. This is up by 20 per cent from the previous quarter and up 21 per cent from the same quarter last year. 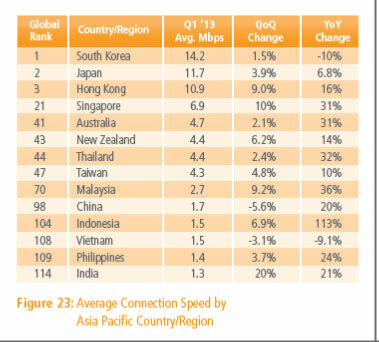 While the jump is the highest compared with other countries in the APAC region, the actual internet connection speed is the lowest among the region, according to Akamai's State of The Internet Report for the first quarter of 2013. The APAC region's top performer was South Korea with an average internet speed of 14.2 mbps followed by Japan and Hong Kong with average connection speed of 11.7 and 10.9 mbps, respectively. China saw minor losses in the category with its average connection speed slipping by 5.6 per cent in the quarter to 1.7 mbps (see table below). India's average peak connection speed saw a 27 per cent increase from last quarter and stood at 10.6 mbps. Compared with the same period last year, it rose 34 per cent. India exceeded China in this category as China's average peak connection speed was 8.3 mbps. High broadband adoption (>10 mbps) rose a whopping 102 per cent from the last quarter to 0.3 per cent. Though still only just above China (0.2 per cent) in the APAC region, it did see the highest jump among other nations. 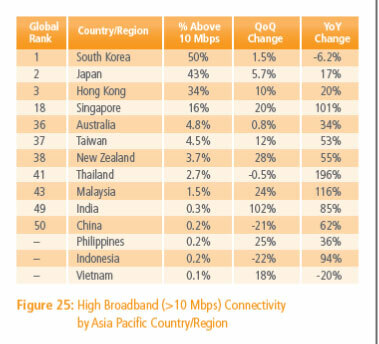 South Korea again topped the list with 50 per cent adoption, being above 10 mbps (see table below). On the other hand, broadband connectivity (>4 Mbps) in India was up by 33 per cent from last quarter and 66 per cent from the year-ago period; it stood at 2.4 per cent. The report said China is contributing the most to attack traffic at 34 per cent, a drop from last quarter's 41 per cent. 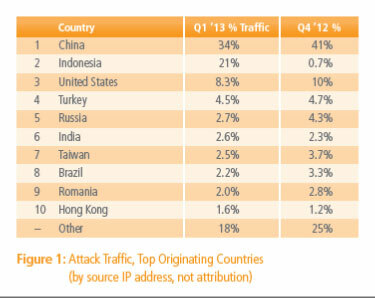 Attack traffic originating from India stood at 2.6 per cent, up from last quarter's 2.3 per cent. However, the report stated that the originating country as identified by the source IP address is not the source of attribution; for example, a criminal in Russia may be launching attacks from compromised systems in China. Refer the table below). Whiled globally, there are around 734 million unique IP addresses, India has around 16 million IP addresses. The full report can be seen here. Year-over-year changes across the surveyed Asia Pacific countries were particularly strong in the first quarter of 2013. Indonesia posted the greatest gain, at 152 per cent, while Japan, Taiwan and New Zealand had the lowest level of yearly growth, at a still impressive 26 per cent. Three countries (Thailand, Australia and Malaysia) grew by more than 50 per cent year over year, with Australia's gain more than erasing the unexpected yearly loss seen in the fourth quarter of 2012. China and Singapore grew more than 40 per cent year over year, while the Philippines, India and Vietnam added more than 30 per cent. With the exception of South Korea, the remaining countries/regions saw yearly increases in excess of 20%. India's broadband adoption rate stood at 10% coinciding with some other countries such as China, Indonesia and Vietnam. Quarter-over-quarter changes were mostly positive, and fairly nominal, across the qualifying countries/regions. While Malaysia and India did show quarterly increases above 10% (growing 18% and 33%, respectively), growth in the other countries/regions fell below that level. Australia, China and Vietnam posted quarterly declines in broadband adoption, losing 5.6%, 12%, and 1.3%, respectively. Globally, there are around 734 million IP addresses which increased 3.1% quarter over quarter and 10 per cent year over year.